Gallstones is a digestive disorder caused by cholesterol, among other things found in bile. The size ranges from being smaller than a grain of sand to large as golf balls. Most gallstones do not cause issues, however if they block a duct, then it will usually need treatment. Gallstones develop when cholesterol and other particles are found in the bile, making up the stones. They can form in the gallbladder when it does not empty as it should. People who are overweight and are trying to lose weight quickly are more likely to develop Gallstones. Most people who develop gallstones will experience no symptoms. If there are symptoms, it is likely a mild pain located in the pit of the stomach and upper right part of the belly. This pain can spread to other regions of the body, upper right portion of the back or even the shoulder b area. The pain varies from being severe or come and go; it may also grow when you eat. When gallstones are blocking a bile duct, you could develop pain along with the chills and a fever. The skin or the white of the eye may turn yellow. If you experience these symptoms, you should contact your doctor immediacy, as having stones block your bile duct can increase ethe chance of developing a swollen pancreas (pancreatitis) or an infected gallbladder. You should also call your doctor immediately if you experience sudden, or severe pain in the stomach or chest, and you are not sure what is causing it. Gallstone symptoms may store feel like chest pain caused from a heart attack or other serious ailments. When you decide to go the doctor, the doctor will likely ask you questions to determine where the pain started, where it currently is, and if it comes and goes. The doctor may also order an imaging test to look inside, to see what could be causing it. An ultrasound test is usually the best why to find if you have gallstones. Both tests are painless and are non-intrusive. Gallstones develop when cholesterol and other materials in the bile form hardened crystals that become stone-like. The Gallstones can occur when the gallbladder is not properly disposing of waste, or there is too much cholesterol in the bile. Too much cholesterol in the bile is not caused by eating too much cholesterol or having high levels of cholesterol in the blood. Most doctors believe that even microscopic gallstones in the gallbladder can cause these symptoms. These tiny stones form a type sediment within the bile called biliary sludge that is visible with an abdominal ultrasound. The most common symptom people experience pain the stomach area or upper right part of the belly below their ribs. Start swiftly in the middle your upper stomach within the epigastric area, and spread to our right upper back and shoulder blade. You will have difficulty getting comfortable and moving around until the pain subsides. Cause you difficulty taking regular breaths or deep breaths. Last anywhere from 15 minutes to 24 hours. In particular cases pain can last from 1 to 5 hours. Starts at night and is so severe that it will wake you up. Gallstone pain can cause vomiting, in which the body may be attempting to relive some of the abdominal pressure and pain. The pain can also occur with a fever, nausea, vomiting or a loss of appetite. This may indicate that there is inflammation or infection fo the gallbladder (acute cholecystitis). These are typical symptoms of other conditions, including a heart, attack, liver problems, the stomach flu, food poisoning, heartburn, which have similar symptoms to gallstones, Diarrhea and vomiting will also occur in the flu or food poising, but the pain comes and leaves rather than stay consistently. Pain with these conditions is usually throughout the entire body, rather than one region. Stomach pain that comes and leaves, rather than being consistent and nausea and vomiting, with a mild fever, is more likely to be a stomach flu or food poisoning rather than gallstones, specifically, if other people around have been sick or are sick. Gallstones progression depends on whether you exhibit symptoms. Most people with gallstone do have any symptoms and do not need treatment. Those who do have symptoms will often have surgery to remove the gallbladder. 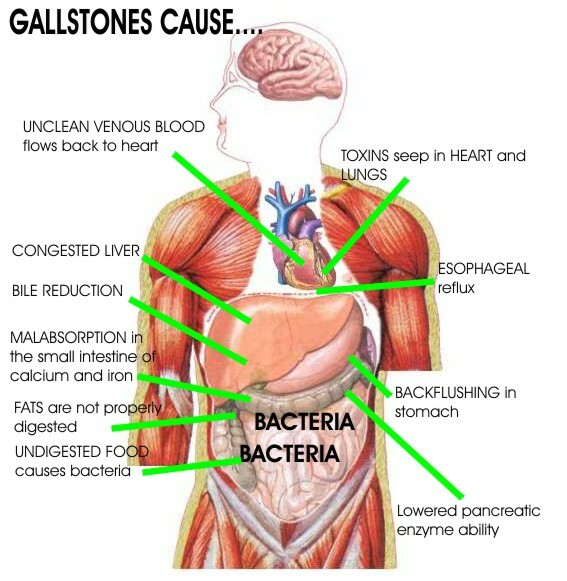 People with gallstones that don’t cause symptoms, usually remain free fo symptoms. The most common problem gallstones cause is blocking the cystic duct. This duct drains the gallbladder; This can call pain that can be last from 15 mins to 6 hours, which is usually severe. The may also get worse after eating. These symptoms normally improve within a few days. If you feel this pain due to the gallbladder, it best to wait and see if the pains leave without having surgery. IF the pain is severe and you had it before, you may need to have your gallbladder removed. If you are experiencing any of these symptoms you should see a doctor confirm what is happening and determine the proper treatment. ← Am I Pregnant? What are Pregnancy Symptoms?